Great Handmade Elk Mountain Man Shirt or Woman's Indian Style Dress. This is a very large and cool looking Elk Shirt for a man or maybe used as a dress for a woman. All and all it is great as a Wall display on a cabin/lodge wall or western room or office. It is simple and not antique. The sun has bleach out the back a little. But doesn't show at all when hanging on a wall. 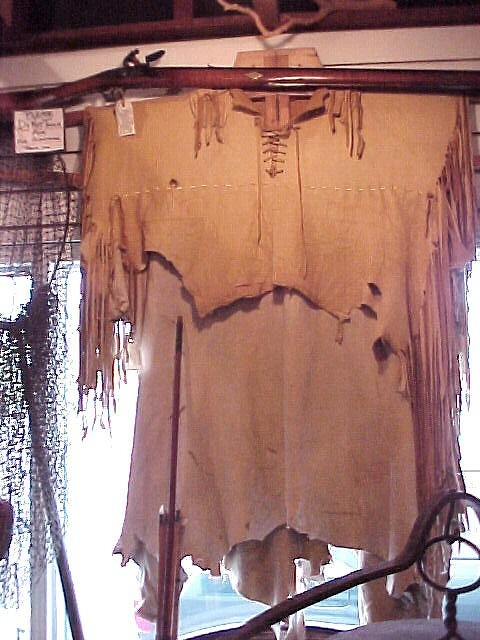 About 3.5ft X 4 ft.
Great Handmade Elk Mountain Man Shirt or Woman's Indian Style Dress. This is a very large and cool looking Elk Shirt for a man or maybe used as a dress for a woman. All and all it is great as a Wall display on a cabin/lodge wall or western room or office. It is simple and not antique. The sun has bleach out the back a little. But doesn't show at all when hanging on a wall. About 3.5ft X 4 ft.. Please email cowboycabin@centurytel.net with questions or call 406 270-2842.